Ecommerce has been on the rise massively in recent years, but simultaneously, mCommerce continues to become more popular. We have observed a Paradigm shift in the usefulness of a mobile phone. There has been a growth in Smartphone Internet users. People don’t limit the usage of smartphone only to chat, share Facebook posts, or pictures on Instagram. There are several other implementations of the smartphone that the users have been utilizing. Digital wallets appear to be a win-win for both merchants and consumers, with most apps free of added fees. Merchants, however, may incur third-party costs to implement Masterpass on websites, or apps. Most prominent digital wallets are Google Wallet, Apple Pay, Android Pay, Samsung Pay and PayPal. Other digital payment systems include Venmo and MasterCard’s Masterpass, which is being promoted rather heavily in recent weeks via TV ads. Note that Masterpass, unlike Apple Pay, is also compatible with Android devices. India has seen a massive shift towards the digital age since the implementation of demonetization. PayTM, is been widely used as the digital wallet in India since then. JackThreads, a NY-based men’s clothes retailer, has noted the decrease in the abandonment after the adoption of Apple Pay. Millennials, moms and multicultural shoppers are driving the future of mobile shopping, says a Facebook study. This audience is younger, more diverse and more focused on mobile. They use their phone to pay for parking, for food, for taxi booking, and other such services. Online merchants should keep these segments in mind for while diversifying their products. 33% of customers return the clothes they’ve bought online simply because they couldn’t try them on prior to the purchase. AR and VR solutions will address this issue and will dominate mCommerce steadily and rather easily. Alibaba’s Buy+ VR shopping experience is overwhelming. The company has also announced that they are working on an AR game in the style of Pokémon Go, which will aim to drive online traffic to offline locations. Wouldn’t it be amazing to send your customers a promotional notification or message for an ongoing sale or offer while they are near your store or location? 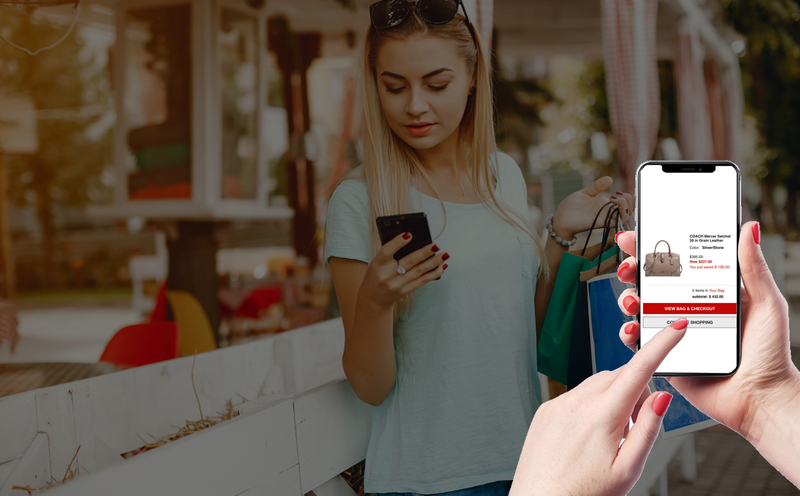 Geo-targeting, geofencing and Beacon-based solutions offer proximity marketing to the merchants. Geo-targeting enables merchants to deliver targeted messages to mobile phones within a certain geographical radius. Geofencing enables the merchants to set up a virtual fence around their location so that when customers are nearby they receive a push notification. Beacon-based solutions can serve up coupons and other offers once the customer is in the vicinity of the beacons. In 2014, m-commerce made up 11.6% of the $303 billion U.S. e-commerce total, according to data from the U.S. Census Bureau and comScore. BI Intelligence, Business Insider’s premium research service, used this data to forecast that m-commerce will reach $284 billion, or 45% of the total U.S. e-commerce market, by 2020. TrendForce estimated the value of the mobile payments industry will reach $780 billion in 2017. LetsNurture believes that mCommerce will experience strong growth in the years to come. With adept knowledge in the latest digital and mobile commerce trends, our skilled developers ensure to adhere to the technological advancements. Several eCommerce companies have already taken steps to integrate their digital world to give their customer a unique mobile experience. Are you the next in line to adopt the same? If yes, share your unique digitization idea with us. Write to us at info@letsnurture.com.